I've been in a few internet arguments in my day. As many as I've been a part of, I can recall no such argument that has resulted in either party changing their stated position or even coming out on the other side feeling like a better, more complete person. The only possibility for the latter, in my experience, is each person in the exchange feeling a sense of confirmation that they are right and the other side is incredibly delusional. Thankfully, I've had enough cyber-scrums to know when to pull back or avoid things getting too heated. If this is how such things make you a better person, then I will happily claim it for myself. A fair amount of these arguments have involved theology. One more memorable back-and-forth that played out over several days saw someone argue, with absolute certainty of course, that their view was correct. As I recall, we were discussing the nature and attributes of God, and my conversation partner's side featured many advanced theo-philosophical terms that would have most people's heads spinning if they were peeking over our shoulders to read. My side was heavier on personal anecdotes and experiences, as I attempted to think through the topic more pastorally than academically. What would such concepts and beliefs say to the family grieving a loved one, or seeking reassurance during a time of anxiety? The other participant was having none of it, and suggested more than once that it didn't really matter. What mattered was that God--unchanging, unmoved by the world, and mostly in the business of causing events for God's own glory--is sovereign and ultimately unconcerned about the joys and sufferings of creation. Many theological topics see this sort of doctrinal rigidity, where explaining in overly complicated ways who God is takes precedence over how or why it matters to human experience. This includes the concept of the Trinity, which theologians and church leaders have been tying themselves in knots to explain for centuries while also arguing how important it is that Christians believe it despite its strangeness. After all, to hold Trinitarian belief is to uphold Jesus' divinity, and believing the right things is paramount. 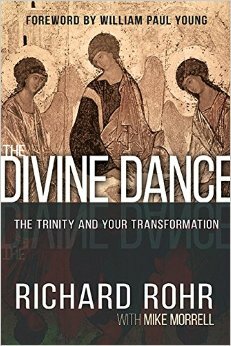 In The Divine Dance: The Trinity and Your Transformation, Richard Rohr and Mike Morrell present a different way to think about the Trinity. As the quoted paragraph above suggests, their concern is less that we get all the ins and outs about how it fits together correct, and more that we understand how God as Trinity is in relationship to God's self and to us. The book is divided into three sections, with many subheadings in each. The latter, which are brief switches in topics usually no longer than a page or two, actually replace standard chapters and seem to alternate between authors. It's often very easy to tell who wrote which parts, as Rohr's pieces take on a more contemplative quality while Morrell's feature more contemporary references and language. The first section is a re-imagining of the Trinity as a doctrine. Rohr and Morrell push back at people's tendencies to come to a point where we just throw up our hands and declare the whole thing a mystery that we should just accept. Very early in their work, one declares that "mystery isn't something you cannot understand--it is something you can endlessly understand" (p. 27)! Their point is that one should always seek to delve deeper into the nature of God rather than come to a point where we stop learning, growing, questioning, and exploring. From there, the authors present the Trinity as relational, both within itself and also to us. "Like probably nothing else, all authentic knowledge of God is participatory knowledge" (p. 49). That is, our knowledge of who God is in general and how the Trinity functions in particular involves our own active involvement in that reality. Believing in the Trinity for its own sake or to be theologically correct is not the point; rather, relating to the Trinity is. Their presentation of the Trinity as a relationship of each Person to the other is not a new idea. But they share such an image in very accessible ways. Foregoing the usual 3-pronged imagery that many prefer (e.g., triangles, shamrocks, and the like), they instead think of the Trinity as a dance where each member is constantly interacting with, working through, and being a part of the others. Thus they think of the Trinity as more of a circle--or, as one author suggests, a rubber band--in order to convey how closely interrelated these three Divine Persons are. Having established their view of how the Trinity works, Rohr and Morrell spend the second section arguing for why this doctrine still matters. As they have already hinted in the first section, here is where they expound on the notion that just as the Trinity is participatory in itself, so too are we invited to participate in it as beloved creatures to whom God as Creator, Christ, and Holy Spirit is actively relating. As an example of the implications for how we live, at one point one of the authors pushes back against the traditional notion of atonement as a transaction, calling it an "abstraction against immediacy." Their argument is that such a belief--or the way we often think about its application--doesn't have any impact on how we live day to day; we don't think about the implications of forgiveness for how we interact with the world. By contrast, they state that a view of the Trinity as participating in a divine dance makes a difference: "When I can stand under the waterfall of infinite mercy and know that I am loved precisely in my unworthiness, then I can easily pass along mercy to you" (p. 135). This view has a responsive component: we are deeply involved and related to who God is and what God is doing, and that changes us and has the potential to change others. The third section is very brief and deals exclusively with the Holy Spirit. As this Person of the Trinity is often the least discussed and understood, this was a needed and appreciated section, particularly as the likely readership for this work will include many who could use more food for thought on the topic. Rohr and Morrell have gifted us with not only a theology of the Trinity, but a spirituality of the Trinity as well. They seem to understand well that such doctrines are not meant solely for the head, but also for the heart and hands. If we considered other beliefs in similar terms, the transformative potential for ourselves and others could be incredible. And it might help us avoid some internet arguments.